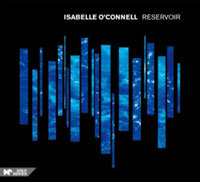 Reservoir is a container of nine fluid piano pieces (penned by nine different Irish composers) that the highly talented Dublin-born New York City-based ivory tickler Isabelle O’Connell has enjoyed playing over the past 15 years. Ian Wilson’s “Big” flows smoothly from thorny to haunting. Jane O’Leary’s “Forgotten Worlds” is more delicate and lyrical with occasional bus stops on dimes. Briefly quoting a bunch of famous songs in rapid succession, Jennifer Walshe’s really-fun-to-listen-to “becher” shifts abruptly from one song and style to another, from subdued to poppy and back again, kind of like a Naked City song scored for solo piano. My favorite track, Donnacha Dennehy’s “Reservoir” maintains a minimally pinging air of intrigue, then, halfway through its 10-minute length, enters an elegant cloud of mystery. You are currently browsing the archives for the Isabelle O’Connell category.